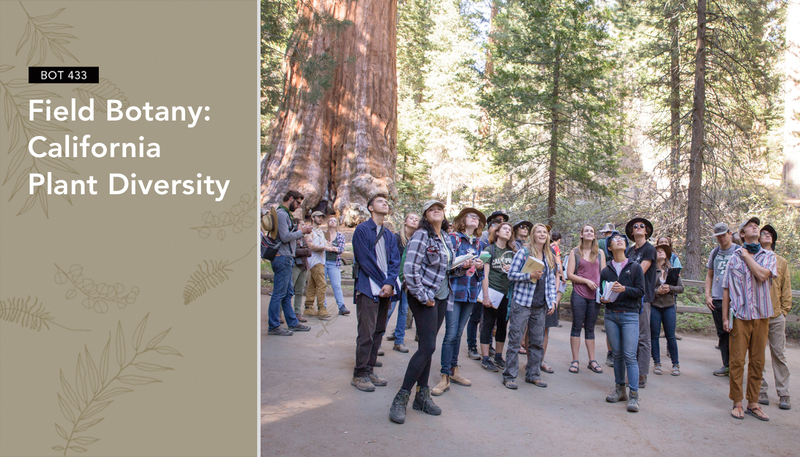 Cal Poly’s Field Botany course has a lot in common with the giant sequoia. Both are native to California and seem a bit overwhelming at first glance. 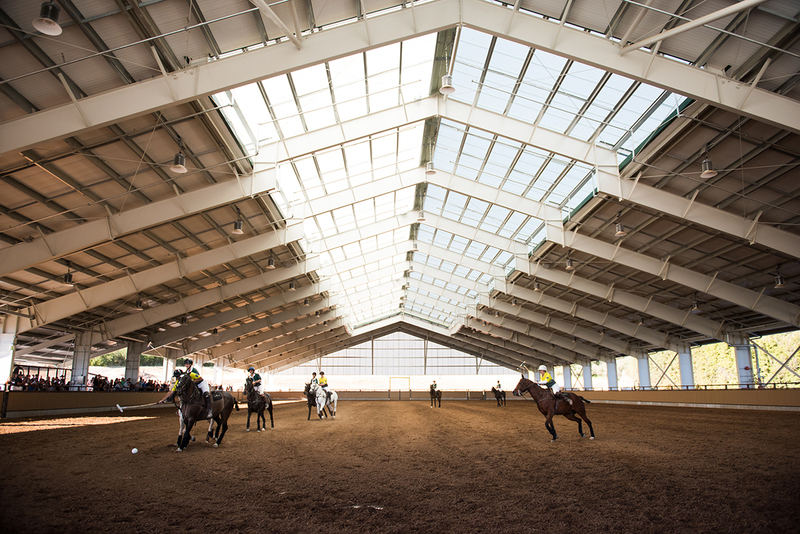 BOT 433 is known on campus for being one of the most challenging and most inspiring classes in Cal Poly’s Learn by Doing canon. Biology Professor Emeritus David Keil taught field botany for 37 years before Professor Jenn Yost brought her trademark exuberance to the helm. The course is now team taught by Yost and distinguished teacher Dr. Matt Ritter. The two lead the class across the state to experience the flora first hand. Students gather around a table of plant samples at their campsite with Professor Jenn Yost. The course’s teaching assistants gather and transport dozens of specimens back to Cal Poly’s herbarium for the final exam. Page by page, students fill a hefty field journal with taped leaves, scientific names and descriptions. Detailed notes will be essential to tackling the course’s notoriously difficult final exam. Teaching assistants put their heads together to key out an unfamiliar species. The consensus: a Verbascum thapsus, or woolly mullein, a non-native species common along California streambanks. According to Yost, many other universities scrapped labor-intensive field courses to focus solely on cellular and molecular biology. But Cal Poly didn’t. Today, Cal Poly’s organismal biology curriculum, including botany, ornithology, herpetology, and mammalogy, is the most comprehensive in the state. To say the curriculum is rigorous is an understatement. In addition to twice-weekly lectures, the class spends more than eight hours on Fridays taking daytrips to explore new ecosystems. Another three weekends are occupied by camping trips to the Mojave Desert, the north coast redwoods and the Sierras. The adventures test students’ self-sufficiency in the wilderness as well as their intellect and observation skills. The capstone course represents a final hurdle for 40 seniors from a variety of majors: to explore the state’s diverse ecosystems through its 6,000 species of plants. Students examine the distinct variations within a handful of plants, including the valley oak, bush seepweed and spikeweed. During a stop along the drive, Professor Matt Ritter points out the colorful fruits of the Western redbud, a native small tree. Ritter is considered one of the state’s experts on trees. The class gathers in a meadow near Hume Lake for a morning lecture. The group will venture into different ecosystems within the Sierras during the day. In addition to having to identify over 200 species on the plant identification exam, students are taken to an undisclosed location where they must independently identify the plants forming the various communities. The stress eventually melts away by the cohort’s end-of-quarter potluck and slideshow. Forestry and natural resource management senior Belén Castillo counts this among the most labor-intensive classes at Cal Poly. “Luckily, I had great teachers to teach me and awesome classmates to study with,” she says. The secret ingredient that makes this grueling course so enjoyable as Yost’s palpable enthusiasm, which can transform the most reluctant botanist into a plant lover.